Pond heaters do a great job of keeping pond water warm, but one of their downsides is the high cost of operating them. The good news is that there are alternatives available, but you must do your research and understand the differences between various pond products. “Pond heaters” were never really designed for ponds, but for aquariums, especially those that contain warm water species such as angelfish and tetras. Most fish inside a standard backyard pond will get through winter fine without it, even when the temperatures fall below freezing. This is because the fish will cease eating which will result in their metabolisms slowing down and they will then sleep during much of the winter without being affected by the water temperature. However, one thing that should concern you is toxic gases such as ammonia becoming trapped beneath the water once the surface freezes over. This is why some pond owners will open an ice hole during winter, so that the toxic gases can escape while oxygen is allowed in. However, how you choose to create the ice hole is extremely important, and you don’t want to use a pond heater. The aerator is one of the most popular alternatives to a pond heater, and the reason for this is because instead of producing an ice hole from the top, it will circulate water underneath the frozen surface. This subsurface movement of water will then open an ice hole. The downside to using an aerator is that it is most effective in milder winters. If the temperatures fall low enough, it may not be enough to produce or maintain the hole. The second alternative to a pond heater is a de icer. This is a device that will float on the surface of the water and will produce an ice hole through melting. The key advantage that it has over a heater is that whereas the heater will heat the whole pond surface, the de icer is designed to only make an opening in a specific area, which then contributes to gas exchange. If you live in a region that often has extreme temperatures during winter, you can also purchase special devices called thermal cubes which are activated by temperature and will come on whenever temperatures fall to below thirty five degrees, and will turn off when they reach 45 degrees or higher. 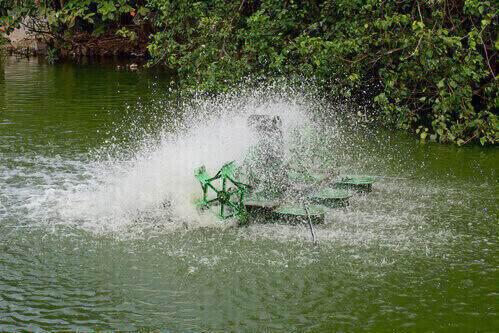 Aerators have a number of advantages over heaters. For one, they are not just restricted to winter usage, and can be utilized all year long. Second, the coils which are used by heaters are prone to failure, especially if they are subject to a buildup of lime scale. Furthermore, many brands of pond heaters will shut off automatically when pond water temperatures rise above freezing, which may not always be desirable. Aerators, by contrast, use small air bubbles to enhance oxygen dissolve levels, which maintain a vibrant ecosystem, and the costs are a fraction of what you will pay monthly for a heater.